This is a roadtrip of a different kind - exploring a paper trail over 100km long. 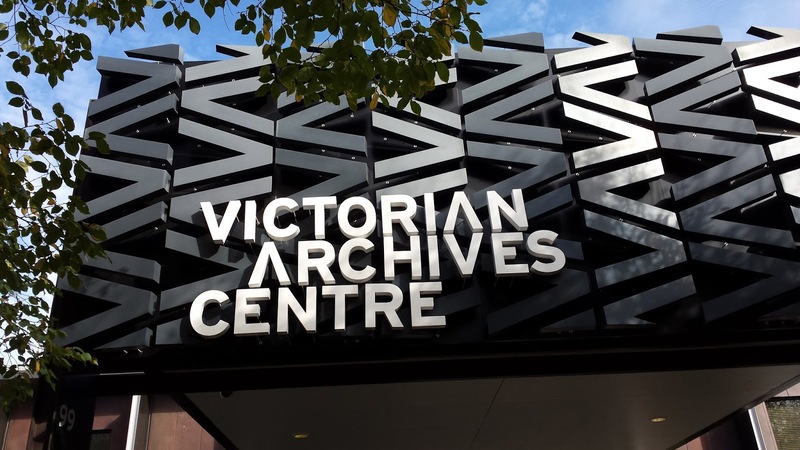 The Victorian Archives Centre and Public Records Office offers a free guided tour of the archives once a month - bookings required. We checked our belongings at the front desk and our tour guide, Leigh, led us through the Reading Room and down into the repository. The hour flew by, as we wandered up and down the rows, stopping to look at documents, art, artefacts and furniture. We heard fascinating stories behind some of the items and learned of methods used to digitise files and restore water damaged documents. Once the tour was finished, I checked out the current exhibition in the foyer, Transporting Art. From 1978 to 1993, 36 artists such as Mirka Mora, Clifton Pugh, Michael Leunig and Mental as Anything each transformed a Melbourne W Class tram into a work of art. Images of these works adorn the walls, as well as a photographic display of the history of our trams. Records can be accessed by the public, for projects, family history, etc. See the PRO website for more details and they hold information sessions on a regular basis. You can also volunteer to assist at the Centre. When: Mon - Friday 10am - 4:30pm. Second and last Saturday of each month.